WOW…. 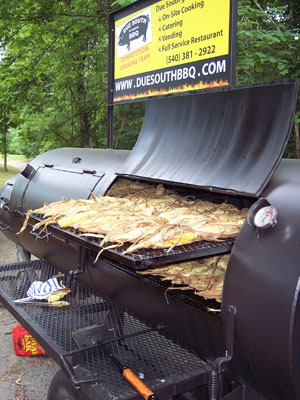 It’s a corn roaster too! We bought our 108 last summer and wanted to let you know we love it. It’s served us well while catering, vending and competing. We’ve continued to win awards for our sauce, but in 08 we added a 5th place whole hog at the VA state championship. We cooked a whole hog, 10 whole shoulders and 12 racks of baby backs at the same time. You asked for pictures a while back, so here’s one of us cooking a couple bushels of corn. The 108 easily gets up to 350+ and can roast corn in the time it takes us to set up for a catering. You can also see the sign bracket worked out really well too. Where is the Lang BBQ Smoker Cooker Factory? The best I had ever done.